Your excellent partner for planning Weddings & Events of your dreams in Croatia! Wedding in Dubrovnik Old Town and wedding in Dubrovnik Palace is the favorite wedding ceremony venue in Dubrovnik and Croatia. If you will choose your ceremony in the superb 16th century Dubrovnik Palace which is located just off the pedestrianized main square in Old Town Dubrovnik you will have indeed a dream wedding in Croatia. After you have exchanged your vows, your wedding party will walk to your wedding reception according to your wishes and needs. Of course, you can choose the same venue for your cocktail after your wedding ceremony as well. All the trading voyages of the Dubrovnik Republic entered in and flowed in through this palace, one of the most beautiful in the city. The trading spirit of Dubrovnik was known to delegate such fitting buildings to itself, thereby confirming its wealth and culture by constructing such a luxurious palace with its impressive facade. It was constructed in a combination of Gothic and Renaissance styles, according to the project by the talented head engineer of the Dubrovnik Republic, Paskoje Milicevic. Its construction began in 1516. The Andrijic brothers, from the well known Korcula family of builders and sculptors, did all the carving and stone works. The Palace was originally intended to be a custom’s house where traded goods brought here from all corners of the world by the traders were to be taxed. The Palace courtyard, entirely in arcades, was the liveliest trading centre and the meeting place for the business people of the Republic. Near the end of the 16th century, the Palace became the cultural centre of the Republic. 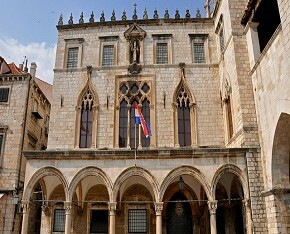 Here is where the most educated citizens of Dubrovnik met in their association “Academy of the Learned”, which had its seat in this palace, The first school in Dubrovnik was also organized at the Palace. Today the Palace, peaceful and dignified, guard the most precious historical documentation of Dubrovnik: the Dubrovnik archive which contains materials from the oldest history of Dubrovnik and the surrounding areas, from all the centuries past to the present day. The palace itself became, in its own way, one of the precious documents of that archive. Other services like dedicated concierge, the possibility to book excursions and island hopping excursions, car rental, private boat or private helicopter and private jet we can provide according to your wishes and needs. If you need airport transportation from/to hotel we also have a fleet of luxury limousines as well at your disposal. Antropoti Wedding Concierge & Planner | Proudly Made With ❤ Antropoti Ltd. Copyright © 2012-2019 All Rights Reserved.